Green your café or deli with compostable deli containers. Round deli containers made from PLA, a plant-based plastic are renewable and compostable. Top Diameter: 4-5/8" Bottom Diameter: 4" Height: 1-9/16"
These 12 oz. round deli containers are renewable and compostable. These pint-sized round deli containers are perfect for serving cold salads. 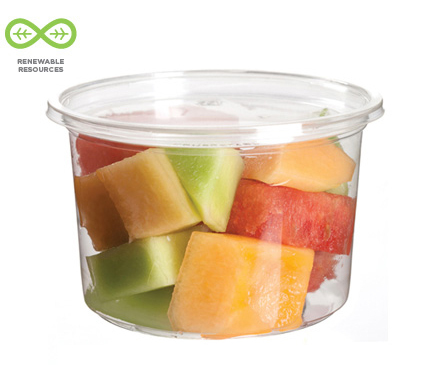 Made from "corn plastic", these compostable deli containers are the perfect environmental solution for serving cold foods. This renewable deli lid fits our 5 oz. round deli container perfectly. This round deli container lid fits our 8-32 oz. round deli containers. These compostable portion cups work perfectly to serve cold condiments like salad dressing, mustard and more. Top Diameter: 2-3/4"	Bottom Diameter: 2-1/4"	Height: 1"
Need a ketchup container? Look no further than our 3 oz. renewable portion cup. Top Diameter: 2-3/4"	Bottom Diameter: 1-15/16" Height:1-9/16"
Use these PLA portion cups to serve cold samples or sides. Top Diameter: 2-3/4"	Bottom Diameter: 2-1/16"	Height:1-7/8"
When that order is to-go, reach for our universal portion cup lids to top off that sauce or dip.